Why is it that some of our best musicians and vocalists turn out so few albums? Such folks are so great that anything they’d do would sell huge, but — for reasons unknown — they limit production. Until now. Listen Here has just arrived. The gestation took way too long, but it sure was worth the wait! Beside possessing a voice and style that are second to none, Ryan is smart enough to recognize the importance of back-up musicians. A stellar group headed by Cyrus Chestnut filled the bill for Doozy, while Best of Love Songs featured Tamir Hendleman, Larry Koons, Red Holloway and others. Well, she has done it again. This album features Grammy Award-winner John Clayton (bass), his brother Gerald (piano), Graham Dechter (guitar), Gilbert Castellanos (trumpet), Rickey Woodard (sax) and Obed Calvaire (drums). This sextet swings wonderfully; they’d make almost any vocalist sound good, and they bring out the absolute best in their leading lady here. Her ballads — “A Time for Love,” “Before We Fall in Love” and “La Puerta” — make you want to slow-dance with a significant other. The latter tune is sung in Spanish, one of three languages in which Ryan is fluent. My favorite is the title track, Dave Frishberg’s “Listen Here.” Ryan sings this with just Clayton’s piano backing her: a very poignant conclusion to a marvelous album. But please, Jackie ... let’s not wait so long to hear you again! We don’t hear true traditional jazz much these days. When bop came along, its influence changed almost everything: melodic lines, meter, chord structure and — most significantly — the way the instruments were played. But not everybody fell into the new ways. This album features a quintet of “traditionalists” who take us back to the pre-bop era, when swing was king. Surprise! These guys are younger than you might expect. 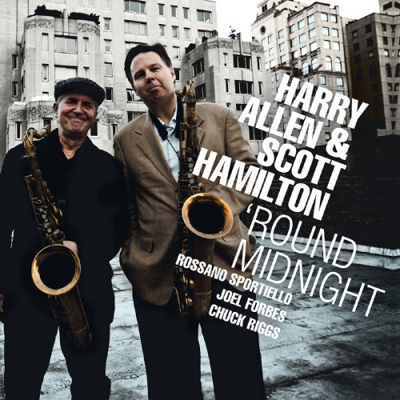 Tenor sax player Harry Allen is in his mid-40s, while tenor cohort Scott Hamilton is in his 50s. Pianist Rossano Sportiello is just 40; bassist Joel Forbes is in his 50s; and drummer Chuck Riggs is the “elder statesman,” in his 60s. Hamilton is the best known of the group, probably because his early career included a stint with the Benny Goodman band. And while these five guys have played together for many years, they’ve also worked with today’s well-known musicians and vocalists. Allen and Hamilton deliver some of the smoothest, most beautifully toned tenor sax you’ll ever hear ... and it’s hard to tell them apart at times. Their idols included the likes of Ben Webster, Coleman Hawkins, Stan Getz and Zoot Sims: four of the best at that instrument. The rhythm section also is a clone of the best who were heard during the Swing Era. You won’t be able to keep your feet from tapping, or your fingers from snapping. This is great swing for at home, at a club, or in a dance hall. Whatever your generation, this music is a joy to experience. 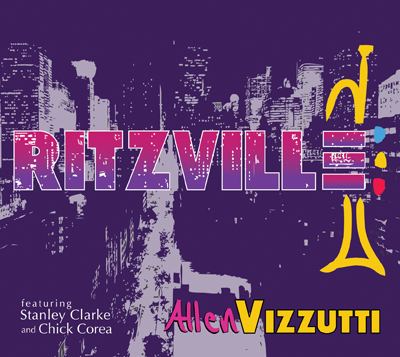 Allen Vizzutti is a trumpeter, composer and educator; he’s a master musician to his peers, but is relatively unknown to the general public. He’s also a perpetual- motion machine who never stops performing. His busy schedule derives, in part, from the fact that he performs in both the jazz and classical genres; he’s scheduled for almost 50 recitals and concerts during one six-month period this year. Vizzutti was born in 1952 and still in his early 20s when he became a member of Woody Herman’s Young Thundering Herd, one of the last of Woody’s great bands. Vizzutti also worked with Chuck Mangione, Chick Corea and Doc Severinson’s Tonight Show Band, and has performed in literally dozens of name military, national, city, state and university concert and symphony orchestras throughout the United States and 40 countries worldwide. Oh, yes: He’s also a mainstay in movie studio orchestras. Ritzville isn’t your usual album. Vizzutti’s trumpet, flugelhorn and piccolo trumpet are the only “horns” featured; no other brass or reed instruments are used. The basic group also contains pianos (Chick Corea, Darrell Grant and Laura Vizzutti), acoustic and electric basses (Stanley Clarke and Reggie Hamilton), acoustic and electric guitar (Mike Miller) and drums (Ronald Bruner Jr.). These artists share duties on the various tracks. A few tracks also utilize a string section: another bassist, half a dozen violins, two violas and three cellos. And a vocalist for good measure. These 11 tracks are composed by Vizzutti, and the styles range from traditional jazz through fusion, at meters from hip-hop to blues and ballads. And, no surprise, the awesome inventory of artists and instruments produces a truly joyous noise. Since Vizzutti is the only horn artist featured, special attention to his performance is warranted. His tone is gorgeous, particularly in the upper registers; it’s brilliant, without ever getting into the screaming mode that so many jazz players create, yet he produces stratospheric notes effortlessly and nails them precisely on key. His techniques with tongue and keys are perfection; I’ve never heard better. That’s essential for classical work, yet when he’s performing jazz, there’s no “stilted” feel to his work. The man can groove with the best. The other musicians are just what you’d expect; you can’t do better than the likes of Corea, Clarke and the other members of this august “rhythm section.” As for the string group, a special accolade applies: It never gets in the way, but always complements the compositions in the best possible way. This album is chock full of great music, and great fun ... and it swings, too! 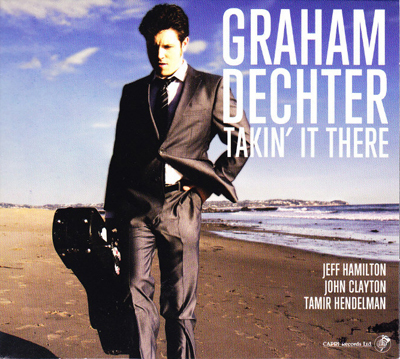 This album, the second released by Graham Dechter and the Jeff Hamilton Trio, is every bit as great as the first, Right on Time. What makes this group so good? Well, all the musicians are members of the famous Clayton/Hamilton Jazz Orchestra (CHJO), one of best big bands active today. Bassist John Clayton, his brother Jeff — who plays alto sax and flute — and drummer Jeff Hamilton formed the CHJO in 1985, and that group has remained at the top of the jazz world ever since. That big band, and combos composed of CHJO members, have delivered numerous releases that help keep jazz alive. Hamilton and John Clayton are the “elder” members of this quartet; Israeli-born Tamir Hendelmen is in mid-career; and Graham Dechter, in his 20s, is the youngest. All four are musician’s musicians, and they’re also composers, arrangers and teachers. Each had college/university training and experience in both the classical and jazz genres, and each is an in-demand accompanist for famed vocalists. And that’s always an excellent indicator of skill and taste. The operative descriptor? Everything swings like crazy! 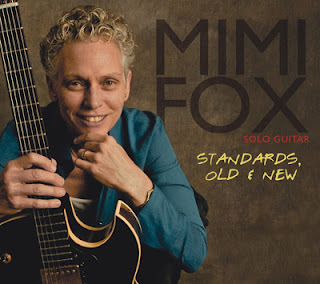 In my mind, the only thing better than a classic jazz trio is the quartet obtained a guitar is added; that instrument contributes a tremendous drive to the unit. Let’s have more great jazz from these guys!